Continuing my day out at Stourbridge, here are some more pictures of the day out, starting with some more of resident glass blower, Charlotte, making a glass heart. And organiser Julie Fountain of Lush lampwork, http://www.lushlampwork.co.uk/ who organised the day out! Here she is finding that wet newspaper is enough to stop your palm being burnt by hot glass! After a look around at some of the wonderful glass at the cone, we stopped for a bite to eat in their tea room before heading to Broadfield House Glass museum. who was working on some glass restoration work making a new foot for an old vase - right down to putting a punty mark like the original. it was time to look around the collection, including the amazing world of cameo glass. Stourbridge was where the way of re-creating the Portland vase was discovered. The Portland vase is a dark blue Roman vase with raised white relief, and for a long time no one was sure how it was made. It was found by putting a small cup of dark glass into a larger cup of white glass, then blowing it into a vase, a blank could be made. From there it was a long task of slowly engraving though the white glass to reveal the dark glass bellow, in the process creating some amazing cameos. At Broadfield they have some of the finest works, including three vases thought to be the best works ever produced using this method. I have to say, they are breathtaking. The photos really don't do them justice, one has a figure with a cape where the layer is left so thin it's translucent, allowing some of the colour though. Unbelievably the museum gets no real funding, and was nearly closed down recently because of local council cuts, despite having an international important collection. I even managed to find a 'flip flop' in the collection! A customer at the stall told me how she played with these as a girl growing up in Stourbridge. At end of day glass makers might make 'friggers' - fun and silly obects such as glass canes and animals - and this was like a glass goblet with a hollow stem. Over the goblet end would be a very thin glass bubble, when blown into it would expand slightly, then fall back, making a 'flip, flop' noise! Of course, I also found a 'little' valve! 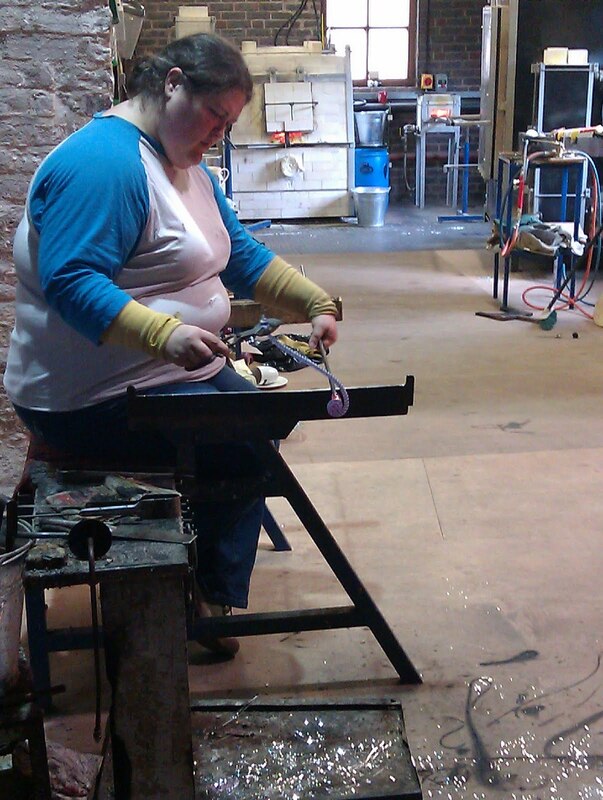 From there we went to The Ruskin Glass centre, which has several studios for glass artists, and has both a strong educational element, along with helping glass artists to develop and launch their businesses. I wish I lived closer, I'd certainly be up for a unit there myself! We met quite a few of the artists there, although we were all starting to flag by this point! One of the most amazing ones we met was Terri-Louise Colledge. Along with painting directly onto glass, she also engraves cameo glass with nothing more than a dentists drill, making stunning works of art. Again, the pictures really don't do them justice. One of these vases (the blue one with ivy leaves and a chameleon - the photo of the lizard side didn't come out!) took her seven weeks to cut away the white surface to make the design. She showed us a previous unfinished version, which two and half weeks into it chipped! It was on a critical part of the work, so she just started again! We all gasped at that, some pointing out we get annoyed if an hours work on a bead goes wrong, let alone weeks of work! where the waters trickles down the layers, spiralling around in each before running down into the next. Of course, it's all made of glass, each section is a screen of an old TV that has been slumped into shape in a kiln - I can't think of a better use of an old TV, or ever seeing a program more relaxing that this. As everyone slipped away I popped off for a quick pizza with some of the lovely ladies from the forum, before getting back to the hotel and getting my boots off! It was an amazing day out, and left me wanting to try out a whole host of techniques. Mostly it has left me with loads of ideas and inspiration, and filling up notebooks of things to try and equipment to buy! I am already organising a workshop move around so I have more room to work! Many thanks go to Julie who organised this trip, and our tour guides who kept us amazing and interested thoughout a long and fruitful day! What a great glassy day out. I love the old TV screen idea. I might fit an old portable in my kiln!